Giveaway: to win a free clean copy of The Jesus Paradigm, simply interact with this summary in a meaningful (not necessarily lengthy) way. A comment will be chosen at random (in approx. one wk. Sunday Oct. 4, 11:59pm; announcement Monday), and the author of the comment will be contacted via email to receive the book in the mail free of charge, compliments of Energion Publications. 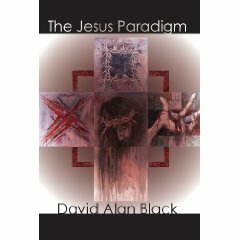 In The Jesus Paradigm, David Alan Black (D.Theol. from U. of Basel and Professor of New Testament and Greek at SEBTS) reflects honestly on New Testament teaching concerning the church—believers and followers of Jesus Christ. The paradigm he suggests should guide the church today is the model given by Jesus Christ. Jesus served and Jesus suffered for the sake of others; so ought those who follow Him. Unfortunately, the 21st century church in America hardly resembles the NT church as described (and prescribed) in the NT. What’s wrong? Black says, “Obedience, not knowledge, is our problem” (63). Servant leadership where pastors are recognized only as equally (though uniquely) gifted believers given for the equipping of differently gifted believers for ministry. (Thus no distinction between ‘clergy’ and ‘laity’). Every-member ministry in which all believers participate in the assembly and minister outside of the assembly. Simplified church structure (organizationally and physically) in which no church member is ‘senior’ and no church building is valued more than people. Apolitical Christianity in which believers pledge allegiance to Christ alone and refuse the adulteration of Christianity with politics, i.e., uphold the separation of church and state. Evangelistic (missional) mindset through which believers recognize their responsibility to love everyone (including enemies) and serve the needs of others (the foremost of which is the need to hear the Gospel). Instead, Christianity in America has largely become political, hierarchal, institutionalized, and nominally evangelistic. Black calls for a return to the NT model of church which is, in his view, modeled well (not perfectly) by 16th century Anabaptists. That is why it is dangerous for you to read this book. The more we know about the kingdom, the greater our obligation to live for it. We are not called to be Americans. We are not called to be Baptists. We are not called to be Republicans or Democrats. We are called to be foot-washers (p136). This book is a needed challenge to the status quo “churchianity” in America which is unfortunately failing to reflect the ecclesiastical picture we have in the New Testament. Why do so many of our assemblies divided their leadership into a hierarchy of “senior pastor,” “associate pastor,” etc. when the New Testament makes no such distinction? Why do so many of our congregations fail to give members of the church an adequate opportunity to exercise their gifts, including the gift of teaching? How should Christians engage (or disengage) in political matters as citizens? (my view). How does national patriotism mesh with the NT emphasis on global missions? 3.) Disengage from many issues as Christians; however, still remained involved as Americans. 4.) It does not mesh well. Look the wars between ‘Christians’ in Europe. Further, we have a notion here in the United States that we alone are the Christian nation, God bless over all, amen. Once you start to take this view, others see you as re-colonizing using American Christianity. this raises important issues. 1- are you in the habit of giving away things that cost? if it costs, is that really a giveaway? 2- are you in the habit of giving away dirty and maligned, mistreated and abused, filthy copies that have been run over by a car or thrown in a ditch? i’m trying to decide if it would just be easier to buy a new copy or enter the contest. 1. Establishing hierarchies seem to be part of human nature. I’m not sure that the NT makes no such distinctions. Paul distinguishes the overseers and deacons in Philippians 1 and the Jerusalem Council event in Acts 15 suggests that if all believers were equal, some appear to be more equal than others. 2. Probably relates to fear and control of those in leadership. 3. Christians should engage in life and in this country part of that life relates to politics. I don’t think I can compartmentalize my life and say that this part of my life I exercise as a citizen, and this part as a Christian. I think that the level of engagement falls into the area of Christian liberty. Some will be more involved and others less. 4. I think that nationalism could, but is not necessarily a hindrance to global missions. I do think that it is helpful to remember that we are Christian Americans rather than American Christians. The demands of Christ are primary, everything else is secondary. 1. Adoption of business models of organization? 2. I might disagree with Dr. Black and say most churches do not have many qualified teachers, but that might be because teachers do not want to find out some else might be able to do their job and then why would they matter? 3. Cut ties from political parties and advocate for issues not ideologies or politics. 4. It doesn’t. This has changed for me in the recent past. Being an America is nice and provides us with many great opportunities (like Paul’s Roman citizenship), but it seems to be a tool for the purpose of kingdom expansion. I, too, have been challenged with issues related to #4 in recent weeks (and months). Tell you what, Jim. IF you are the Number One Biblioblogger for September (and that’s a big IF, right, Joel? ), I will send you your very own FREE and UNDAMAGED copy of the book as a prize. I’ll even inscribe it with flowery prose if you like. You can even write the text! That’s right, Dave. Alexa is lagging a few days behind, and I am only 3700 behind the good Doktor. 3700… yikes. that means there are 3700 blogs somewhere closer than you are! (1) Hierarchy is a handy substitute for faith. If we don’t trust the Holy Spirit to guide and protect, we set up our own visible, physical system. (2) We have been conditioned to make ourselves perpetual children to authoritative parents. And it really does hinge on (1), because it would be what many call “chaos” to trust the Spirit. (3) The way we engage in anything else as Christians: salt and light. There is grave danger in putting even Christianity in political power; just look at how Christians run their own institutions. As long as (1) and (2) are the case, we have no business being trusted with running a government. (4) Should it mesh? Why would it conflict? In fine, that I may not approach you empty-handed, blessed Father, I bring with me this little treatise, published under your name, as a good omen of the establishment of peace and of good hope. By this you may perceive in what pursuits I should prefer and be able to occupy myself to more profit, if I were allowed, or had been hitherto allowed, by your impious flatterers. It is a small matter, if you look to its exterior, but, unless I mistake, it is a summary of the Christian life put together in small compass, if you apprehend its meaning. I, in my poverty, have no other present to make you, nor do you need anything else than to be enriched by a spiritual gift. I commend myself to your Paternity and Blessedness, whom may the Lord Jesus preserve for ever. Amen. “flowery prose” …you weren’t kidding!